The operation of the Berliner required a high complement of both military and civilian staff. These were provided with accommodation in a dedicated Staff Coach, of which two were built by Deutsche Waggon und Maschinenbau in Berlin in 1967. While outwardly very similar to normal DB passenger coaches, these two vehicles were customised to the operational needs of the service. This included fitting diesel generators, fuel tanks, water heaters, roof access ladders and radio transmitters to ensure communication with military bases both in West Berlin and West Germany. 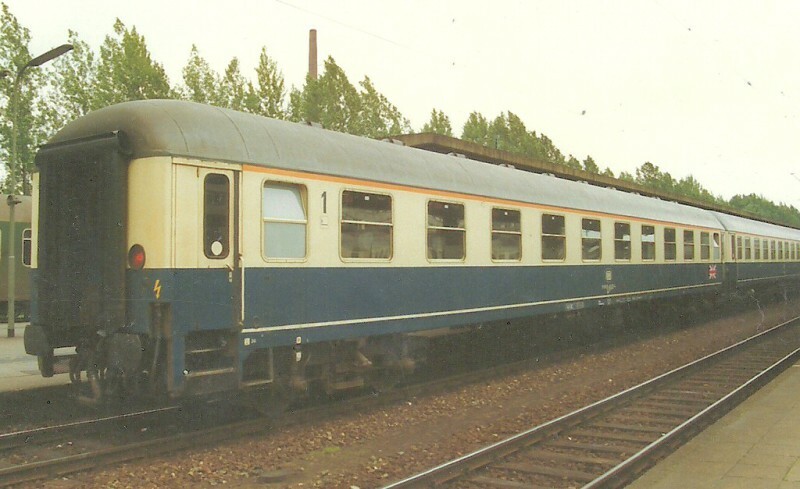 No layout plans of these coaches have been found, but a combination of assessments made using external photographs and recollections of previous military train staff were used to generate an assumed internal layout of the coach shown below. The accommodation is assumed to have consisted of a compartment reserved exclusively for officers' use (12), an office area for the processing of passports and travel documents (11-10), lounge area (9-7), two couchette compartments (6 and 5), couchette compartment with office space (4-3), stores (2) and secure munitions and weapons storage (1) for four armed infantrymen. These were responsible for the security of those on board and, should any military incident have occured, were the ultimate defence of the Berliner and her occupants. 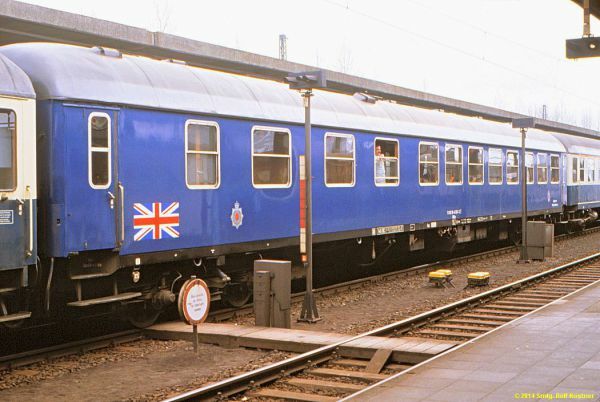 While both coaches were outshopped in the traditional DB express colours of cobalt blue with black underframes, both coaches were refitted in 1985 and repainted in the by-then standard colours of ocean blue and light ivory. At that time, the painted flags were replaced with oversized metal boards carrying the Union Jack - in turn these were replaced with standard-sized DB destination boards. Certainly the culinary highlight of any trip aboard the Berliner, a total of three restaurant cars were constructed for use on the service. The first two were supplied by Wegmann & Co in 1967 (Type WRm) and 1970 (WRüm), whereas the last (WRüm) was supplied by Waggon Union in in Berlin. 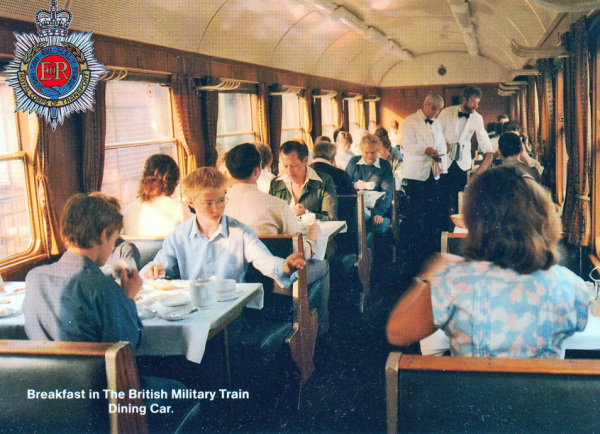 Seating was provided for a total of 47 diners, accomodated in the standard 2+1 seating layout typical for other DB restaurant cars. Underfloor equipment originally included water heaters, chilleer compressors, and gas bottle holders for the kitchen equipment. The kitchens were later refitted with all-electrical equipment, which was usually fed by the train heating power supply powered by the locomotive. However, during times when the loco was detached (as happened at Helmstedt and Potsdam) they were powered by underfloor generators driven by a pair of conventional VW Golf engines! Heating. A roof mounted radio transmitter was installed at the passenger end of the coach, which could be operated from a connection point located beside the seat closest to the kitchen. All were built to the UIC standard length of 26.4m, and weighed between 45 and 47 tonnes. 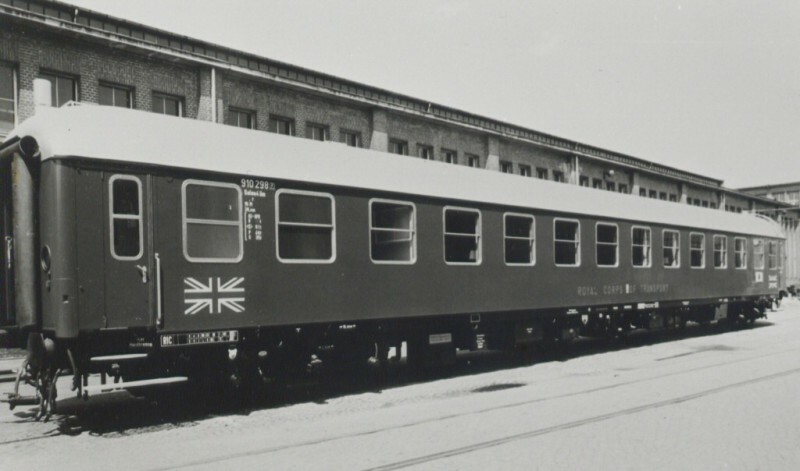 Each of the three restaurant cars was unique, and reflected the developments taking place in DB passenger coach construction at the time. The first featured traditional (noisy!) brake blocks, fixed entry steps and a kitchen located on the right side of the coach, whereas both of the later examples were equipped with disk braking and a kitchen area located to the left side of the coach, the last one also being supplied with folding entry steps. These differences allow each coach to be identified more easily in photographs of the time. Restaurant Car WRüm 51 80 08-80 011-3 at Helmstedt, 27th March 1971. An operational requirement of the Berliner was the ability to withstand several days with no access to or from any external assistance , and be able to provide and cater for all aboard should such circumstances arise. The demands of feeding the trains' passengers for so long would soon outstrip the food storage areas onboard the restuarant car, so three days' food rations were carried in the luggage coach. This also carried any bulky parcels or packages, military post, and NAAFI supplies to Berlin. These requirements could be met quite adequately using standard DB baggage vans, and these were always marshalled between the staff coach and the restaurant car. 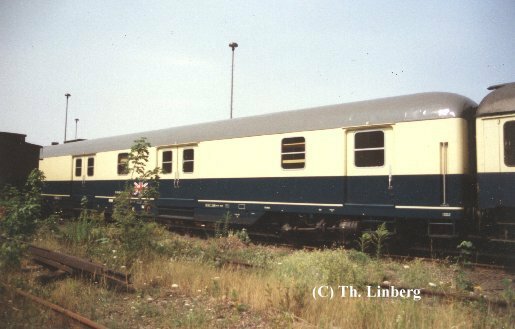 The stock used for this purpose varied over the years; initially composite 2nd Class / Baggage coaches were used (DB type BDms 273), which were replaced in the early 1980s with full baggage coaches (DB type Dms 905) which offered far greater payload capacity. The loss of seating was offset by the ability to add any number of standard DB first or second class coaches to the train. In the very final years of operation (1989/1990), two ex-DBP Postal coaches of type Post m/r-a were aqcuired by BAOR from DBP and converted for this use, equipped with diesel-powered generators and redesignated Type D(Gen). 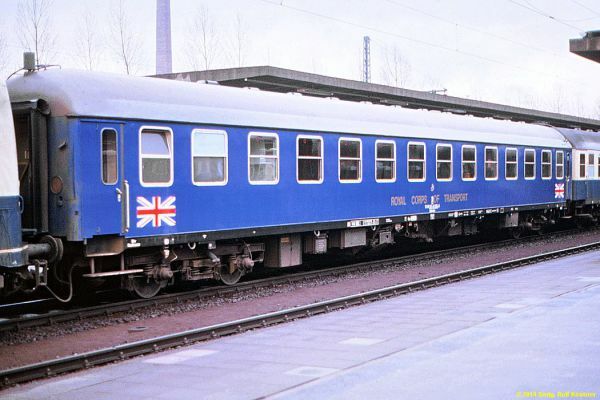 These were the only RCOT-operated coaches in the Berliner not to carry Royal Corps of Transport lettering and insignia - instead, a single Union Jack flagboard was attached in the centre of the vehicle. DB Standard Baggage Coach, type Dms 905 as used in the Berliner. All of the Berliner's passengers were normally accomodated in three standard DB express coaches. 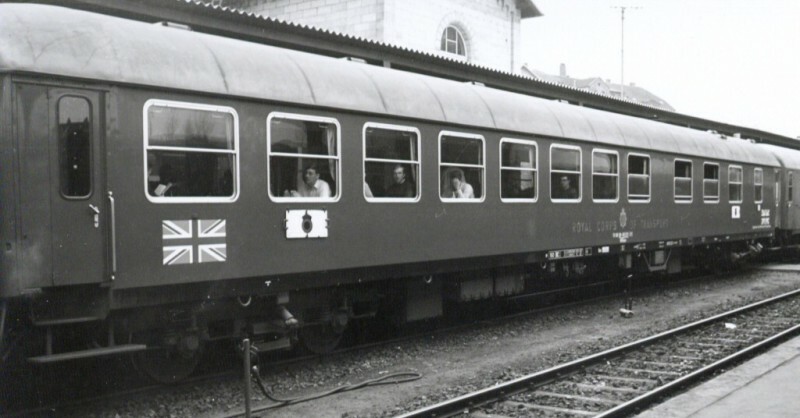 These were initially a mix of first class (type Am 203 / 208) and second class (type Bm 234) compartment coaches, but in later years all three coaches used were first class. 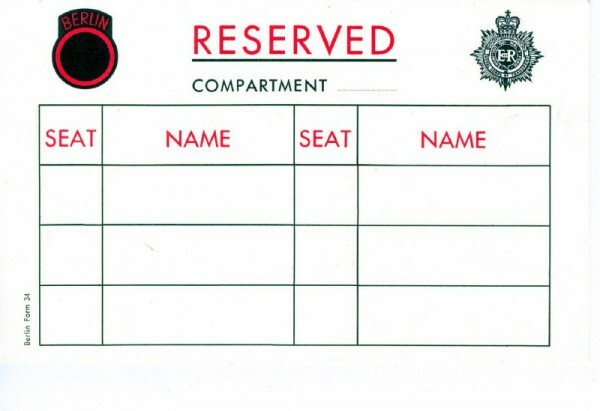 As the officer's coach, baggage coach and restaurant car were all marshalled together at one end of the train, the number of passenger coaches used could be increased to suit demand on particularly busy days; such as the end-of- term movement of pupils from the Forces Schools, or regimental movements. The additional coaches were of the same type used on the regular service, and on such occasions, a second RCOT restaurant would often be included in the train to ensure all passengers could be catered for; a practice unique to the Berliner! 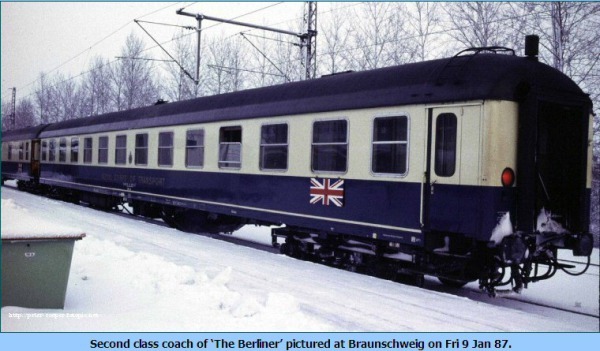 As with every other coach in the Berliner, the passenger coaches each carried a metal Union Jack flag board. These were secured with the clips normallly used to hold destination boards.